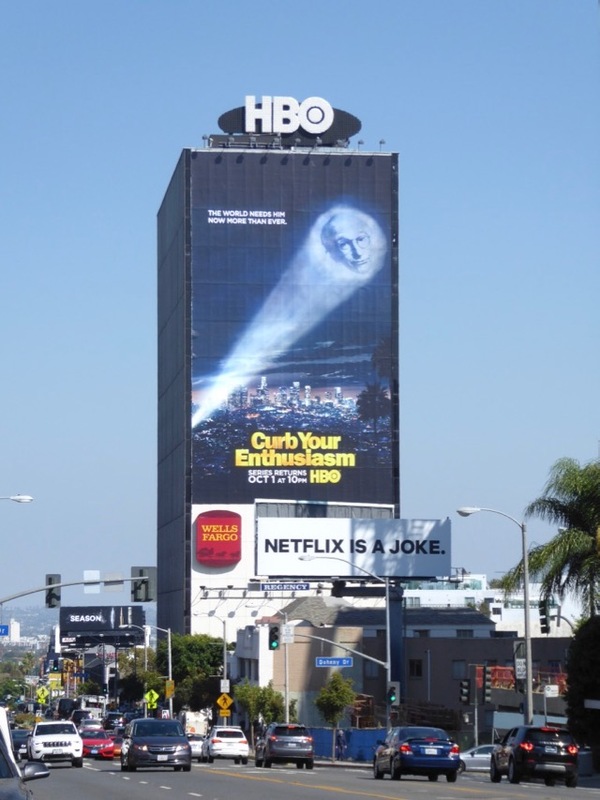 With idiots running the White House, Nazis marching in the streets and the Doomsday Clock ticking ever closer to midnight, you know it's time to send up the signal. 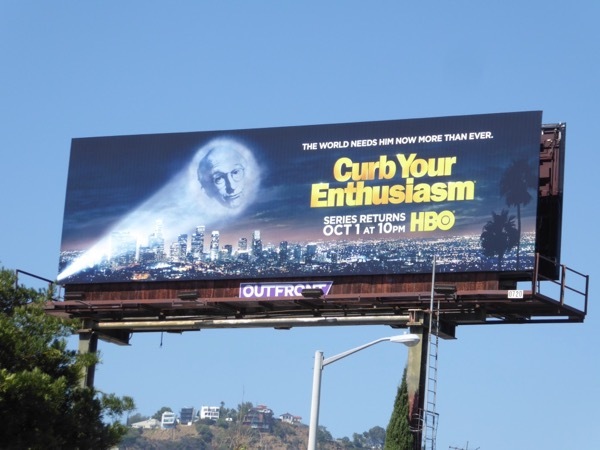 And when 'The Dark Knight' is off playing with his Justice League buddies, who you gonna call, Larry David, that's who. Curb Your Enthusiasm returns for a ninth season this October and after six years off the air, you can bet this fictionalized version of Larry David will have more than a few things to say about the state of the world today and what's been annoying him. 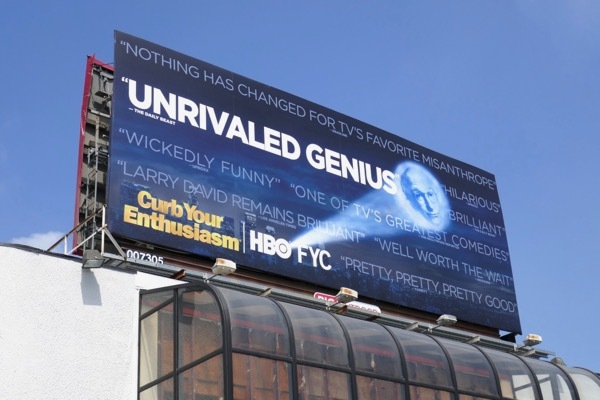 The co-creator of Seinfeld returns to L.A. to navigate his single life in all-new improvised episodes, but also expect to see Larry's onscreen ex-wife 'Cheryl' played by Cheryl Hines, his manager 'Jeff' (Jeff Garlin) and Jeff's wife 'Susie' (Susie Essman), plus lots of other familiar faces and cameos. 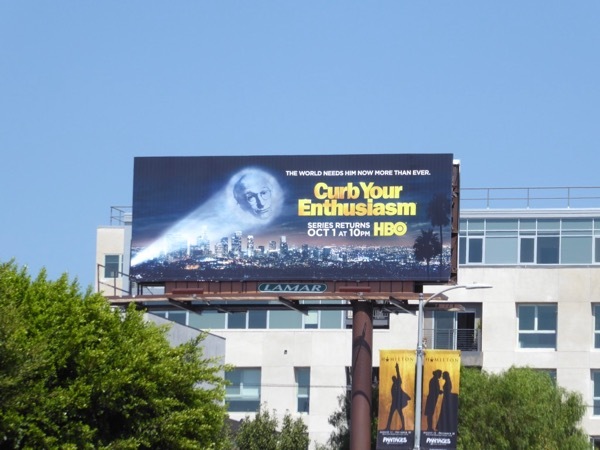 These fun ninth season billboards parodying the Bat-Signal were photographed around the streets of L.A., including along Sunset Boulevard, La Brea Avenue, Highland Avenue and Fairfax Avenue from September 5 to September 27, whilst the giant-sized version was snapped towering over eastbound traffic along West Hollywood's Sunset Strip on September 18, 2017. 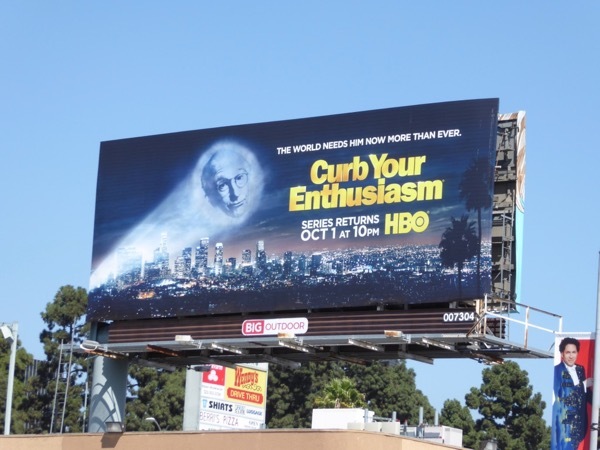 Fans of the HBO show can also check out these Curb Your Enthusiasm season eight Statue of Liberty spoof billboards from summer 2011. 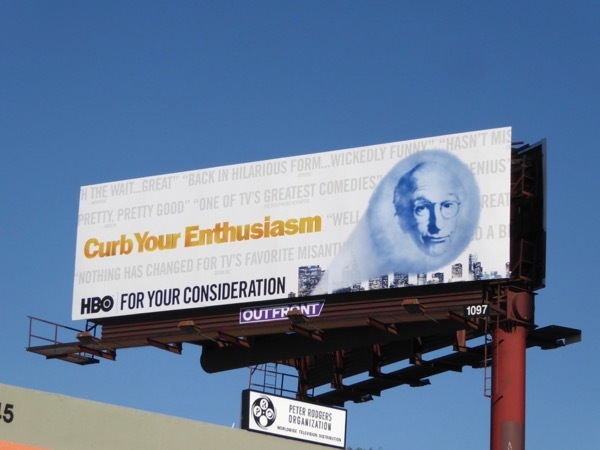 Plus Larry David fans can also enjoy these Clear History HBO telemovie billboards from July 2013. 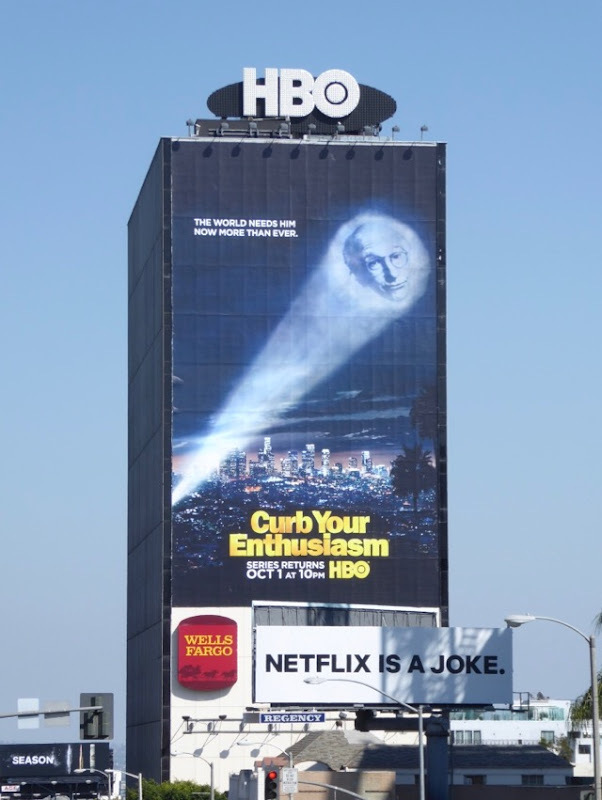 It's true, 'The world needs him now more than ever', so let's see if Larry David can continue to say what we're all thinking with this comedy revival. 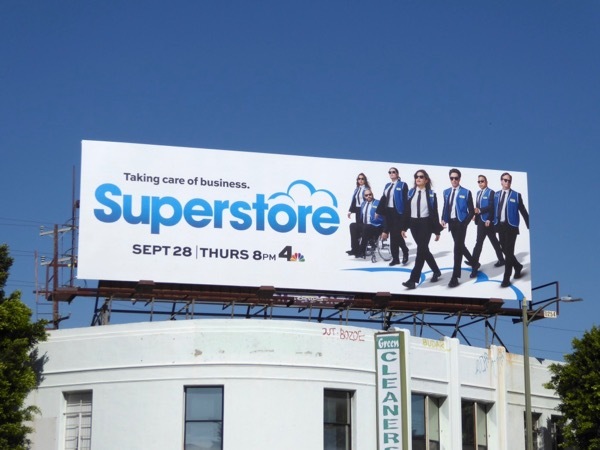 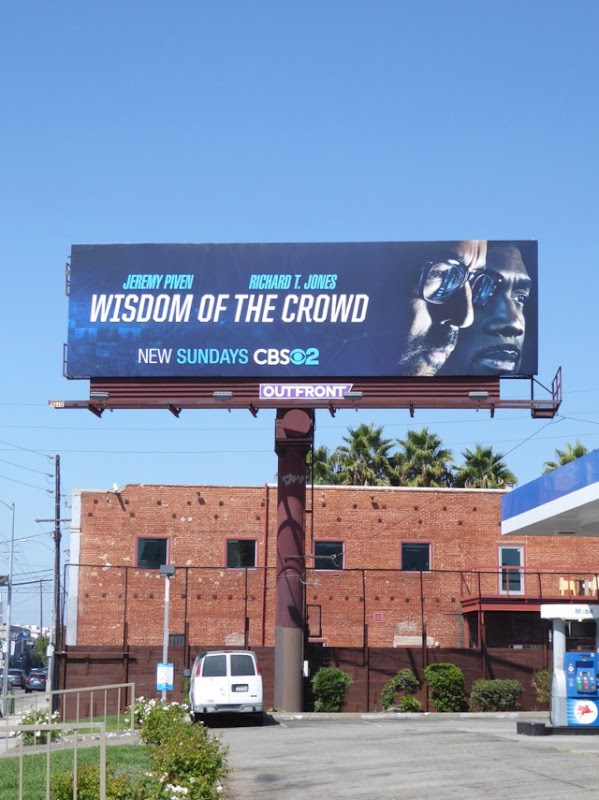 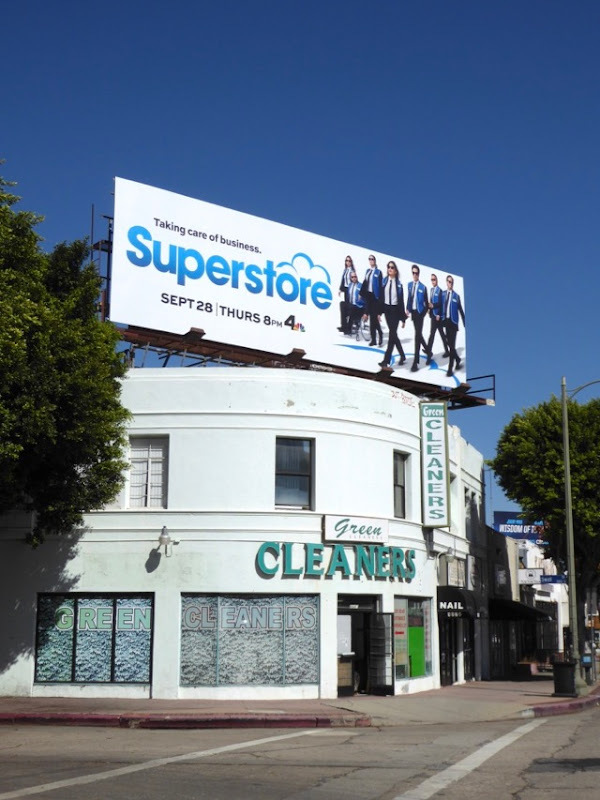 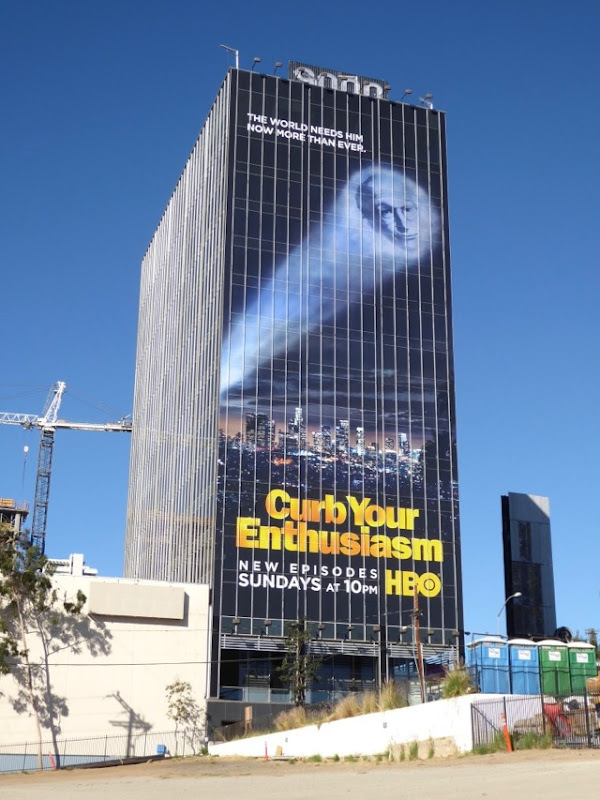 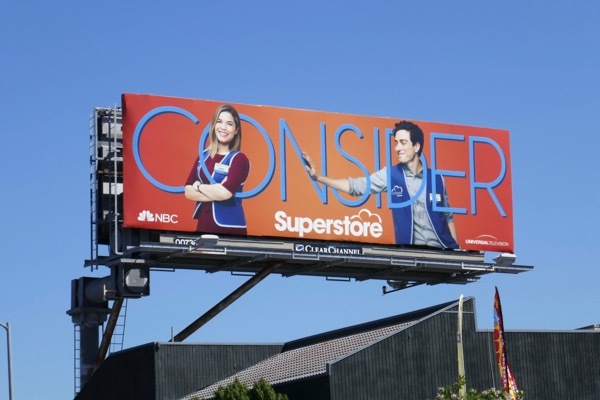 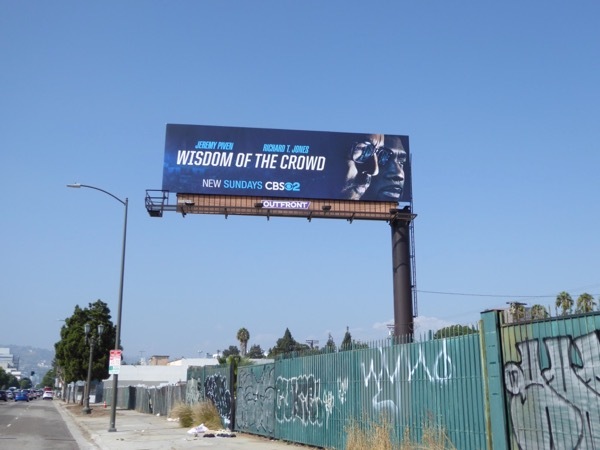 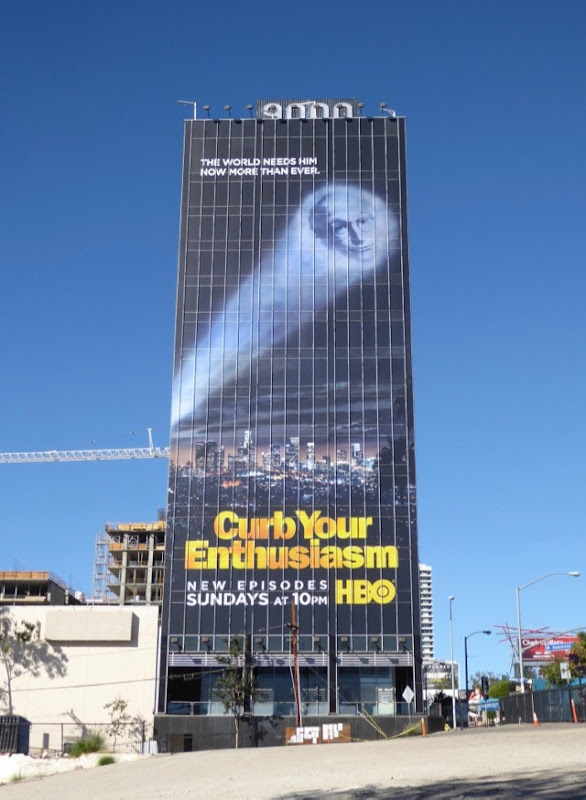 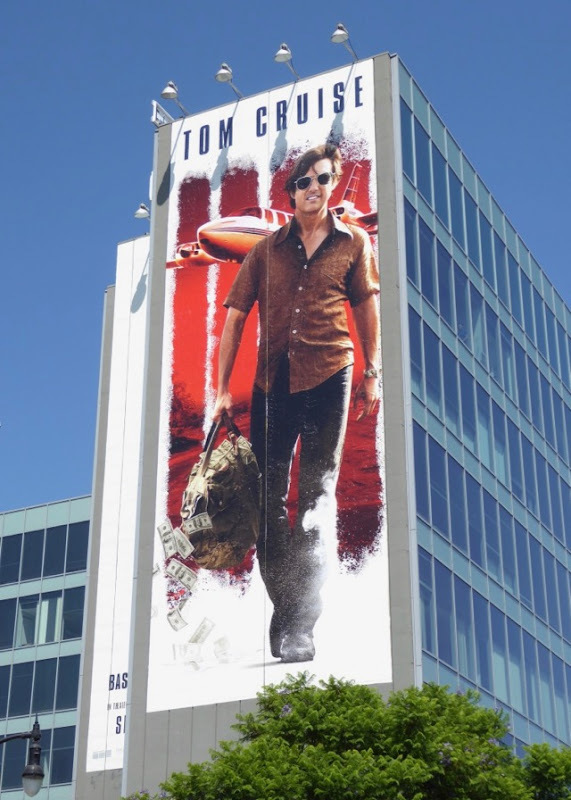 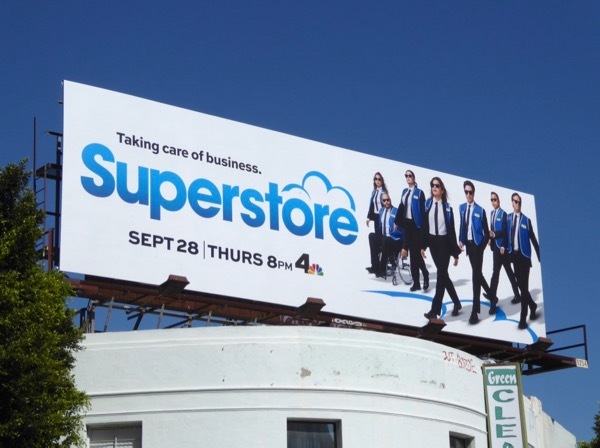 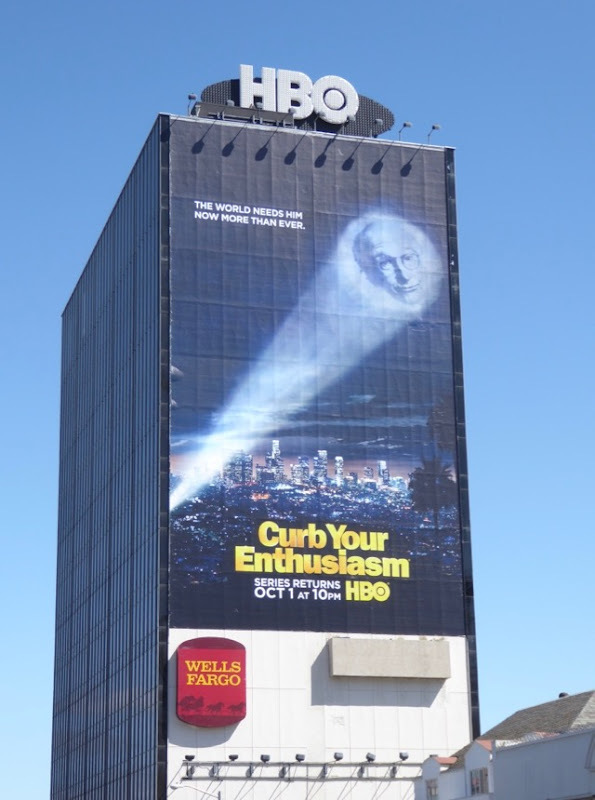 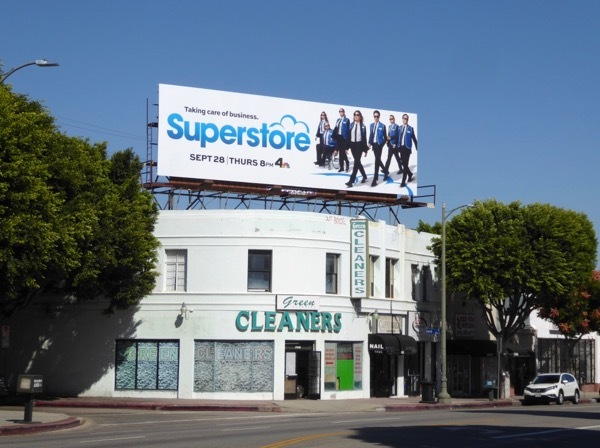 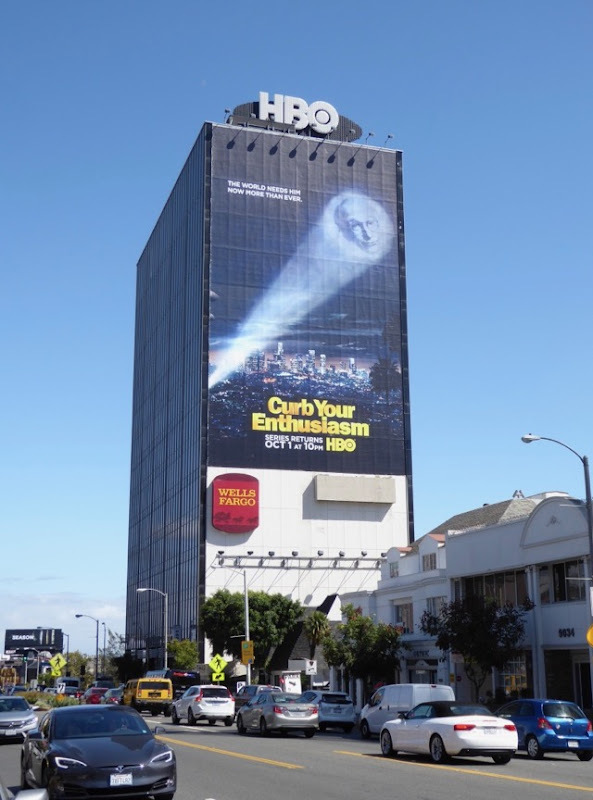 UPDATED: Whether it's because they don't have anything else to promote in a big way at the moment, or whether it's because the new season of Curb Your Enthusiasm needs more viewers, HBO has added an additional super-sized billboard to the side of Sunset Boulevard's 9000 Building. 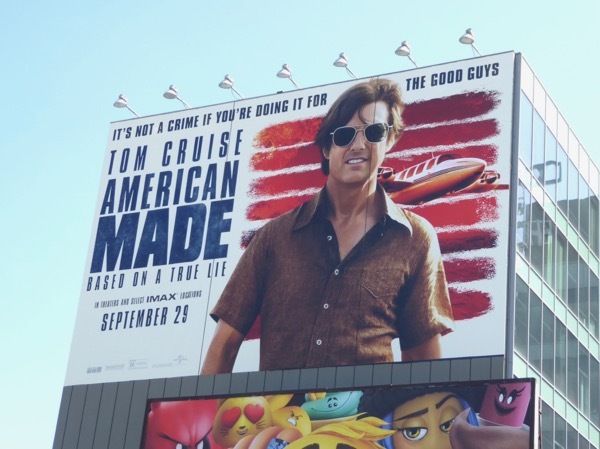 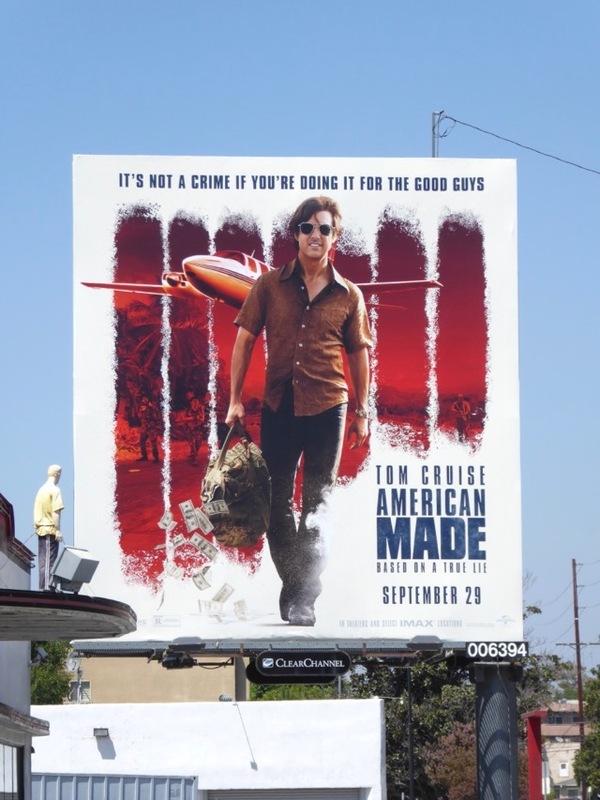 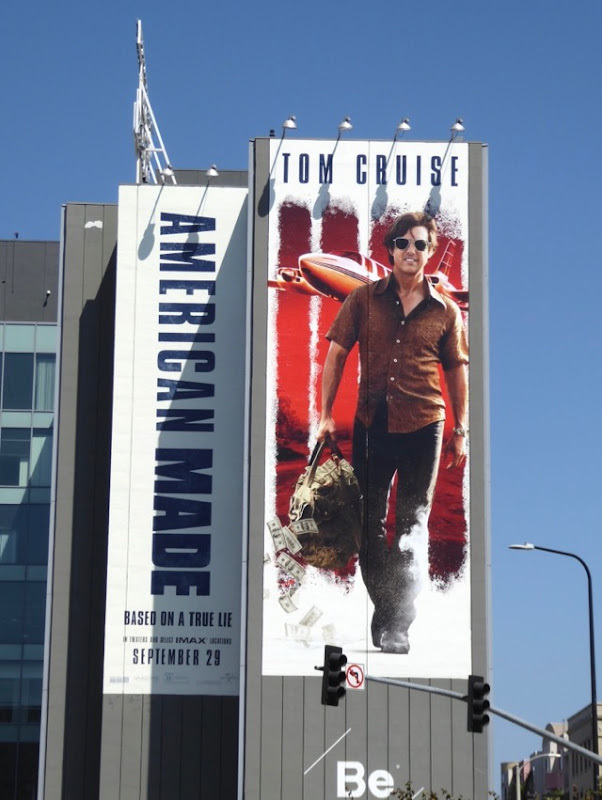 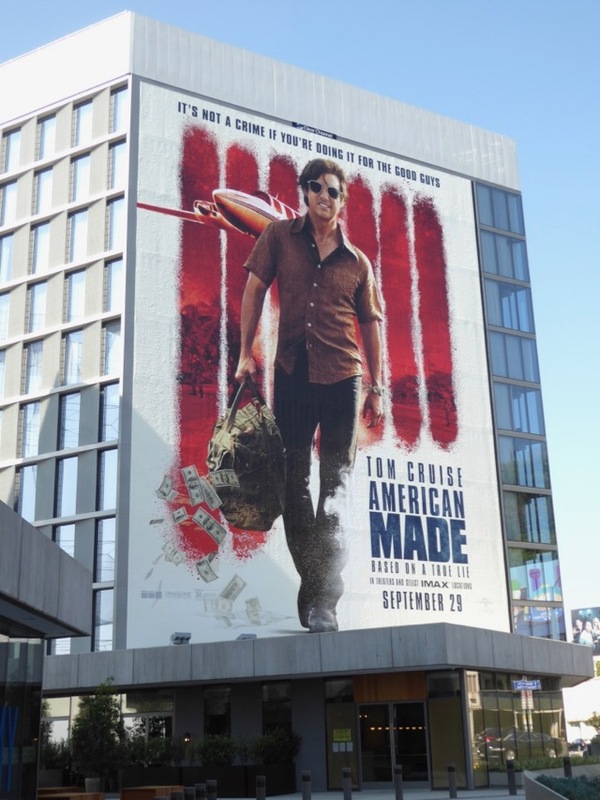 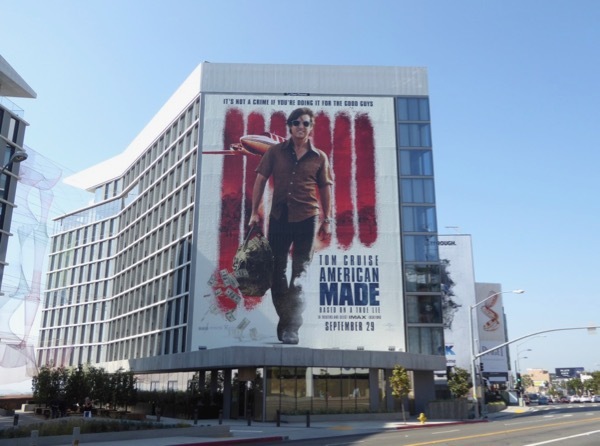 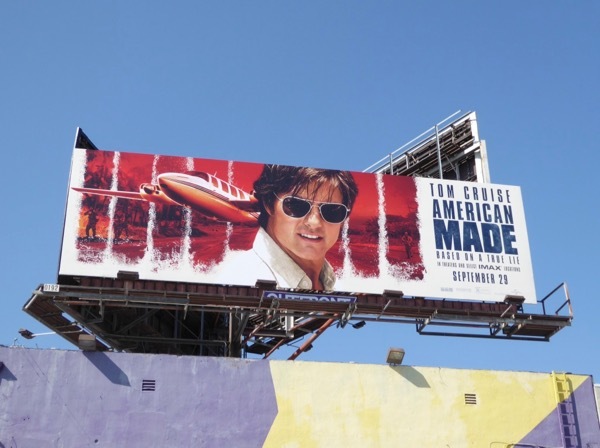 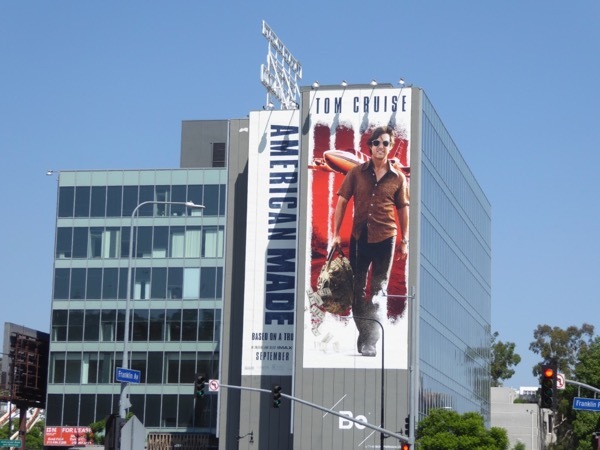 This giant billboard was snapped along West Hollywood's westbound Sunset Strip on October 22, 2017. 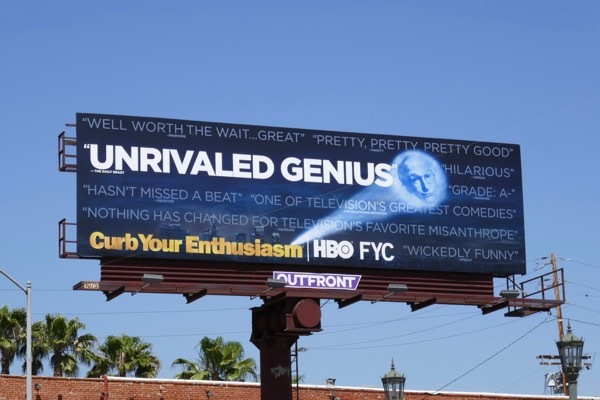 UPDATED: Here's also an awards consideration billboard for the show's ninth season, which is almost a negative version of the season nine key art. 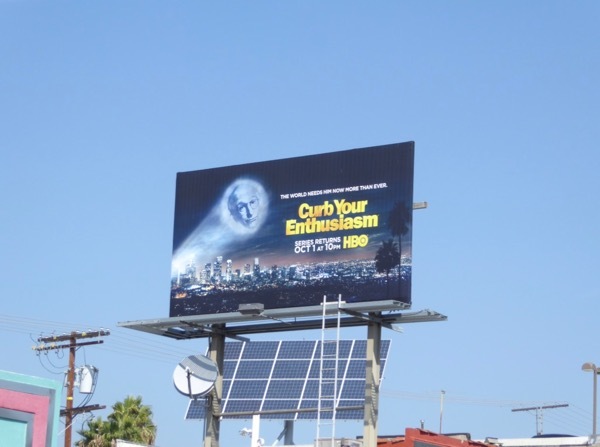 Let's see if this consideration billboard spotted above Hollywood's Sunset Boulevard on November 18, 2017, will help the comedy garner any Golden Globes or other industry awards this season. 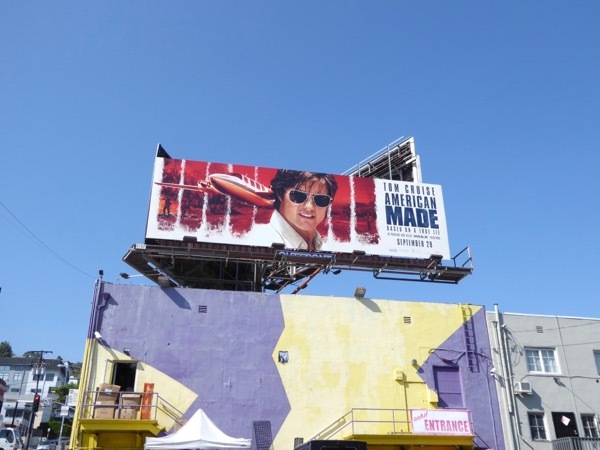 UPDATED: The revived series may not have won any Golden Globes this year, but maybe it can snag an Emmy nomination or two with the help of this consideration billboard spotted at Sunset Boulevard and La Brea Avenue on May 14, 2018. 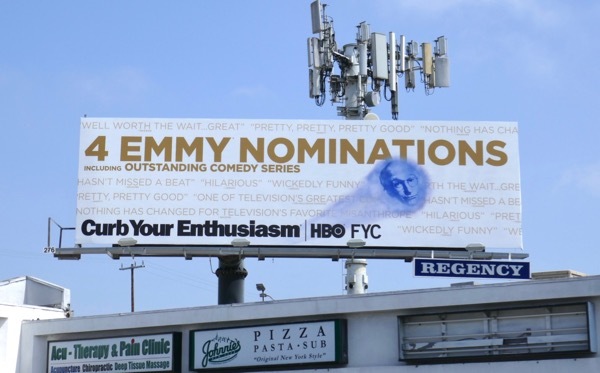 And here's another Emmy FYC example spied along Santa Monica Boulevard on May 16, 2018. 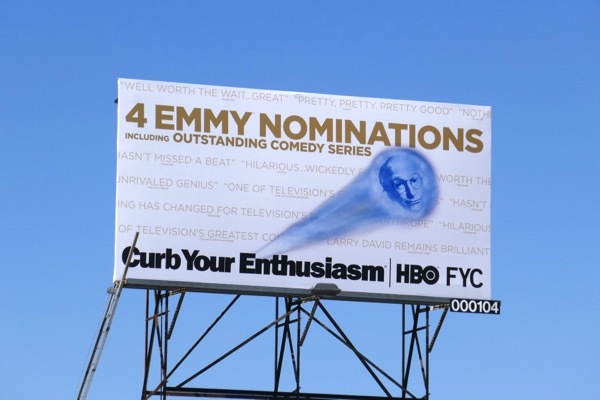 UPDATED: Congratulations to Curb Your Enthusiasm for nabbing four Emmy nominations for this revived season, making 43 Emmy nominations over the show's history to date. 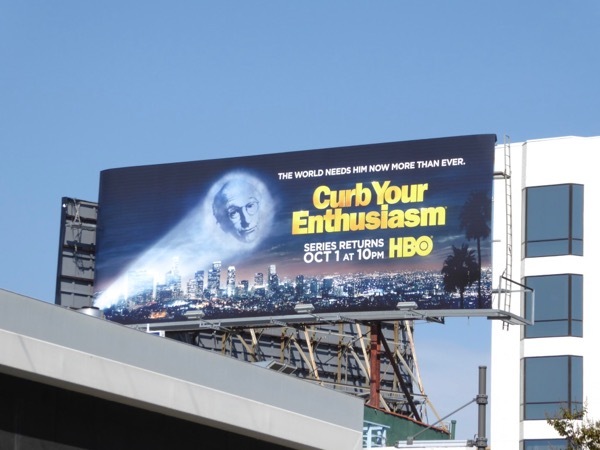 This Emmy nominee billboard was spotted above Beverly Boulevard on August 8, 2018. 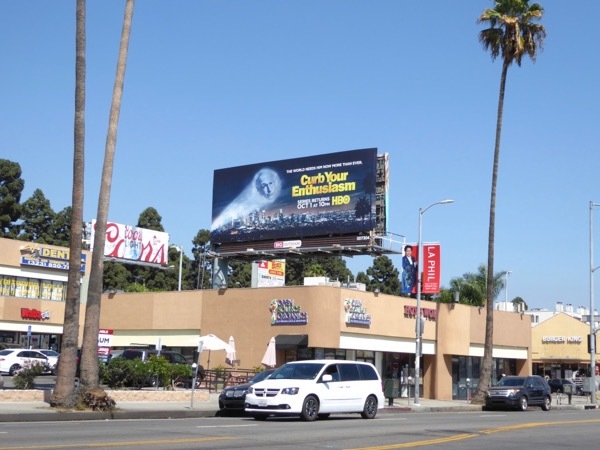 Here's also a larger landscape billboard example spied along Olympic Boulevard at Barrington Avenue on August 17, 2018. 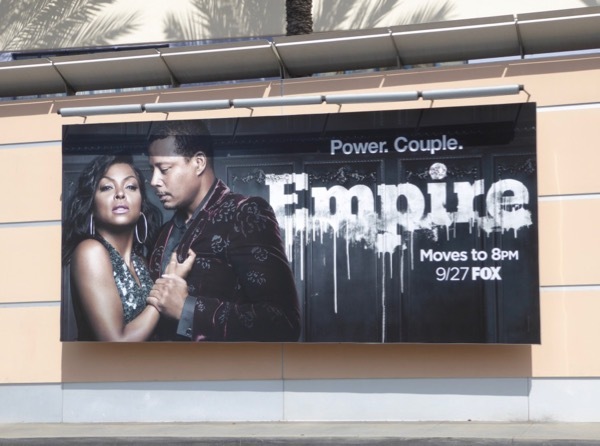 After the explosive events at the end of last season's finale, Empire's 'Lyon' clan are back for a fourth season of coveting power and scheming to stay on top. 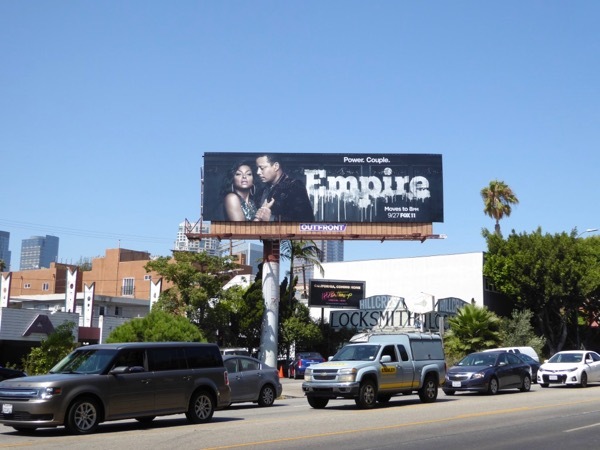 Also joining the cast this season in a multi-episode arc is Demi Moore as nurse helping Terrence Howard's 'Lucious' regain his memory, or is she? 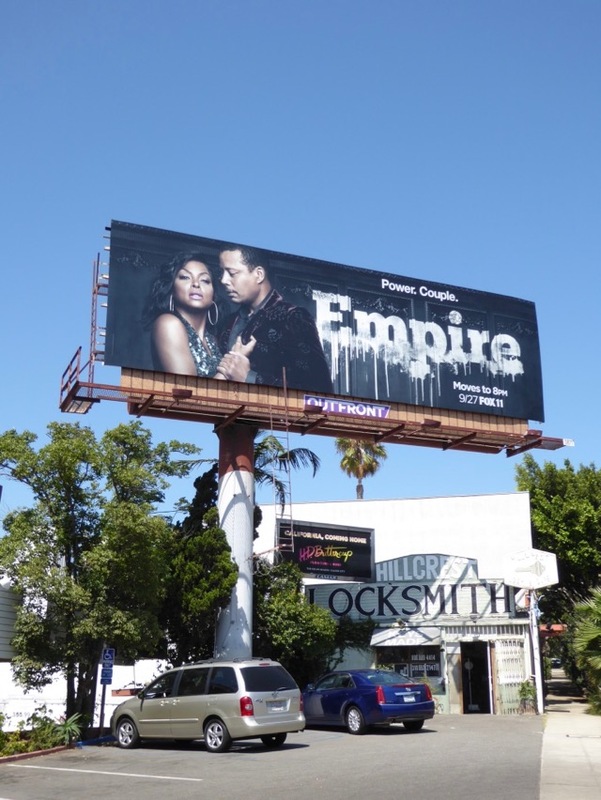 Is there more to her than meets the eye. 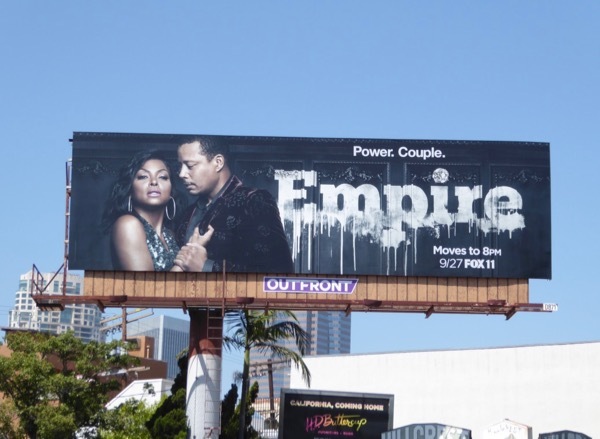 You know that Taraji P. Henson's 'Cookie Lyon' and her three sons, 'Hakeem', 'Andre' and 'Jamal' (played by Bryshere Y. 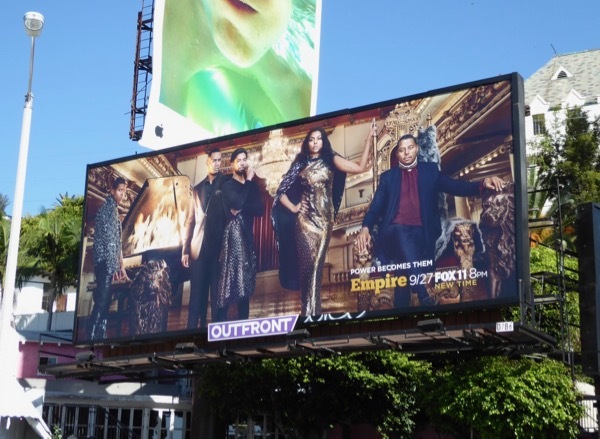 Gray, Trai Byers and Jussie Smollett respectively), will make sure no one steals their family music Empire without a fight. 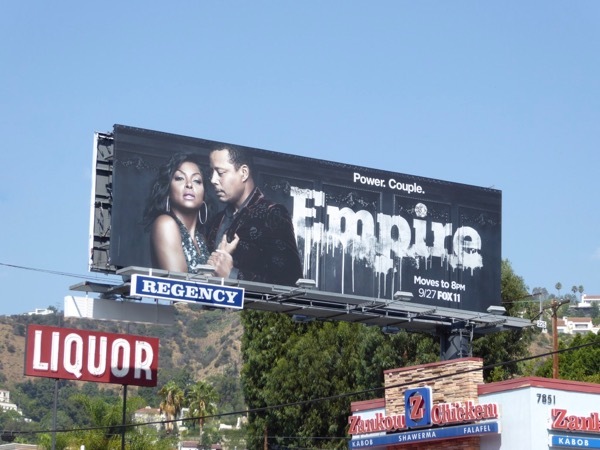 These season four 'Power. 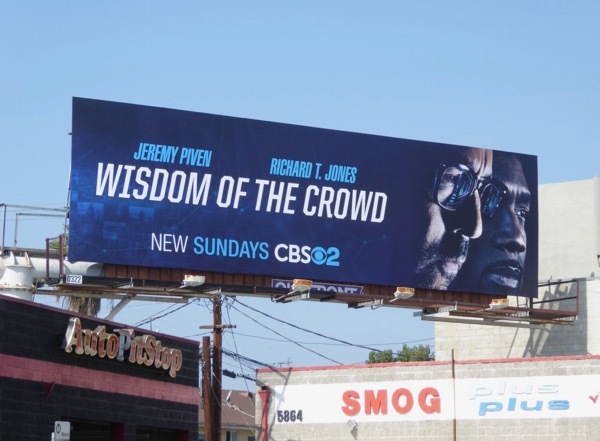 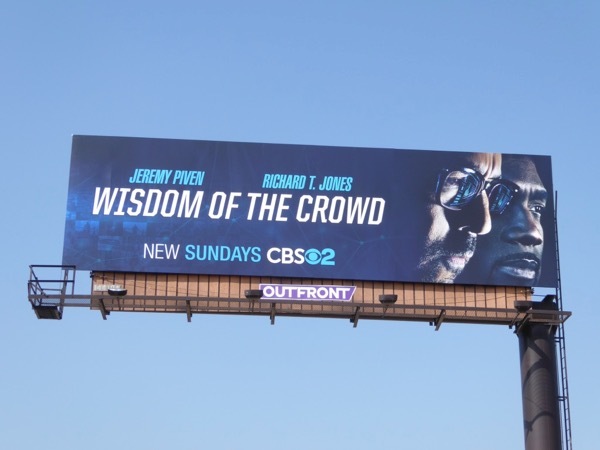 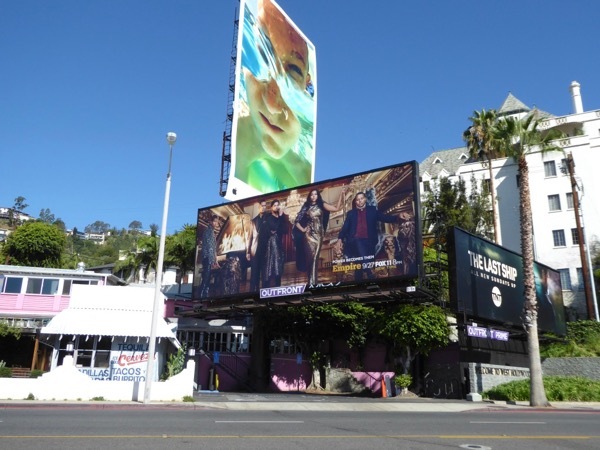 Couple' billboards were spotted along Pico Boulevard on August 9, at L.A.'s Fox Studios on August 26 and along Sunset Boulevard on September 6, whilst the lavish 'Power becomes them' ad creative was snapped along the Sunset Strip on September 21, 2017. 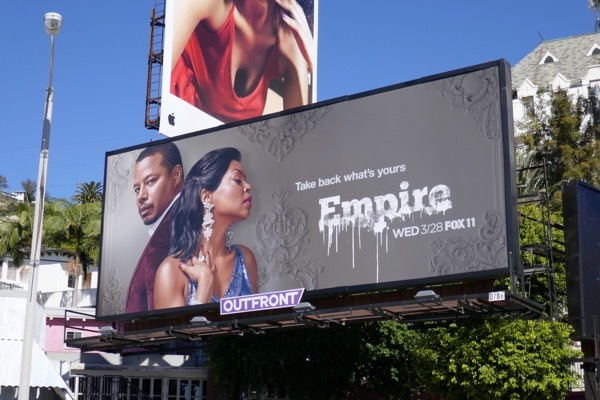 Meanwhile regular viewers of the show can also check out these previous season promo billboards for Empire. 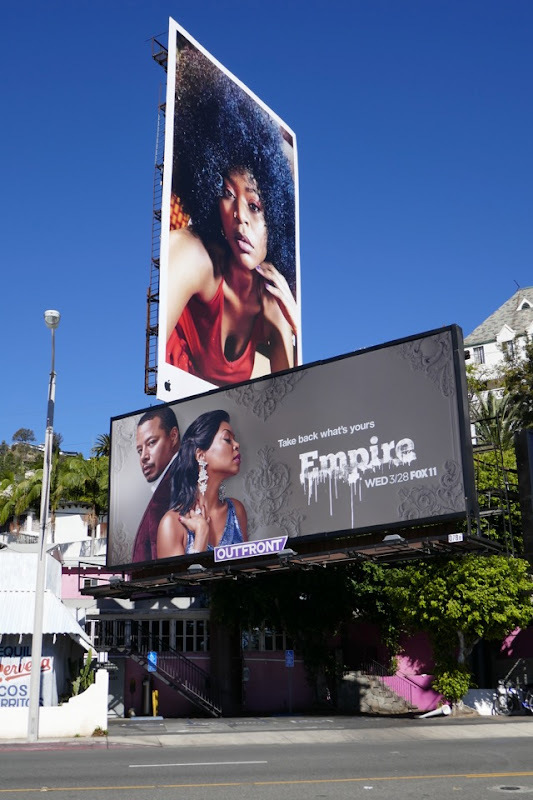 Fans of Taraji P. Henson can also enjoy these Hidden Figures movie billboards and this PETA anti-fur billboard. 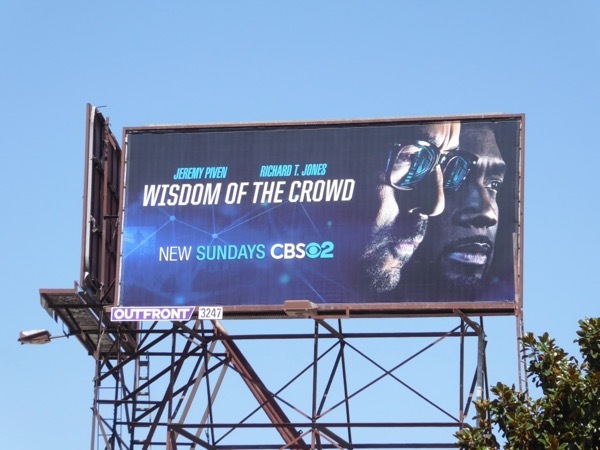 With their father recovering from his car explosion, expect the rest of the family to step up to keep the records spinning and thwart the soapy schemes taking aim at their hip-hop Empire. 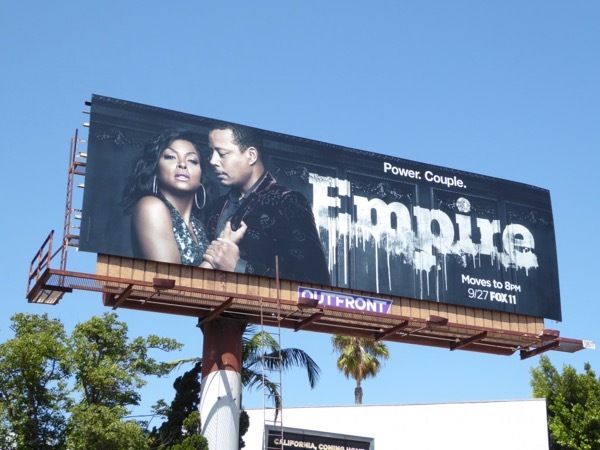 UPDATED: Lucious and Cookie are back for all-new season four episodes and ready to take back what's theirs. 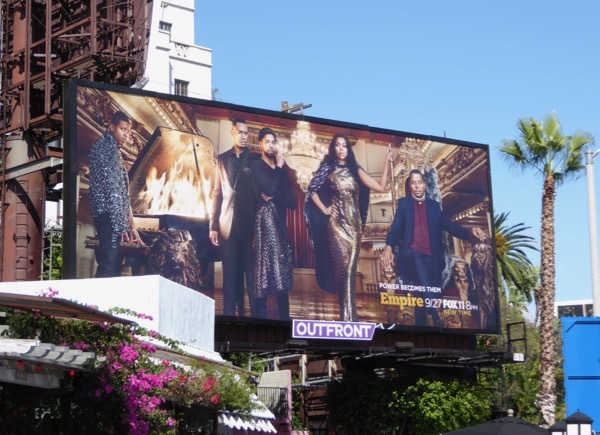 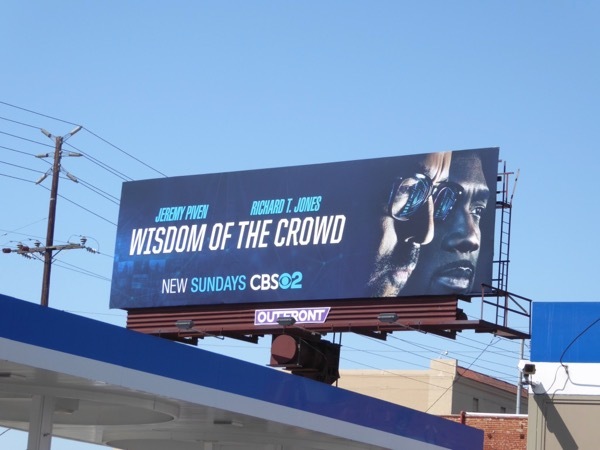 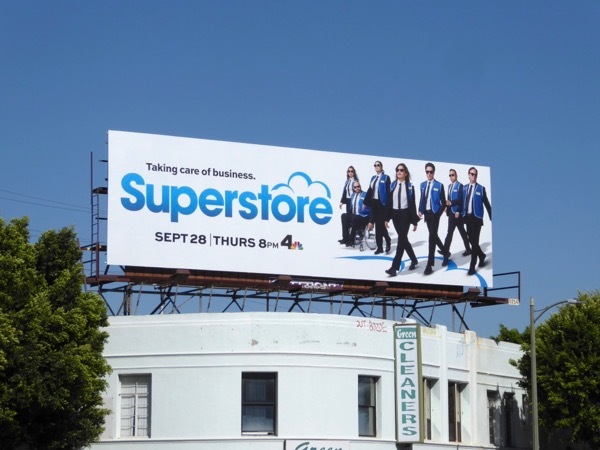 This season four part two billboard was snapped along the Sunset Strip on March 1, 2018. 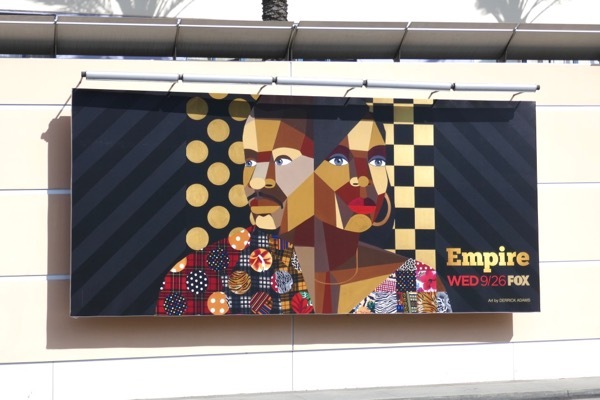 UPDATED: Here's also two billboards for the fifth season of Empire, with the graphic teaser billboard (with art by Derrick Adams) snapped at Fox Studios along Pico Boulevard on September 8, 2018. 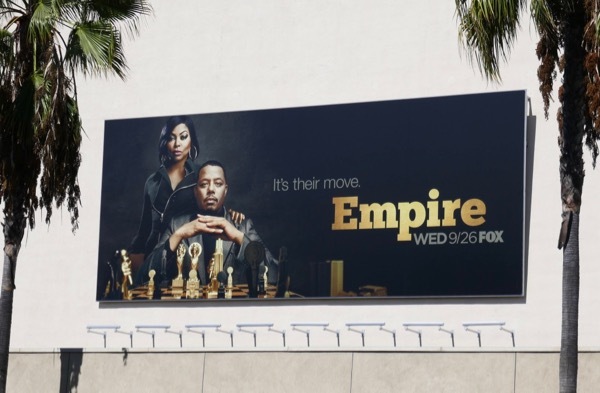 Plus the chessboard version featuring Taraji P. Henson and Terrence Howard was spotted at L.A.'s Fox Studios on September 30, 2018.